Available in Sets, Individually or Pairs. Central, Rear, Straight Eye designs. 5", 12", 18" & 24" sizes for gates up to 10ft wide. 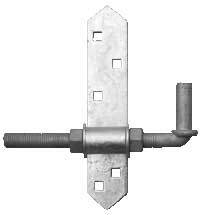 Adjustable Hangers, Hold Back Hooks, Hangers on Square Plates, for Masonry and a whole range of pins to satisfy all requirements. 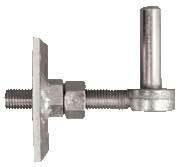 Throw Over Gate Loops, Spring Fasteners, Heavy Duty Hasps, Irish Gate Latch, Cane Bolts and Slide Bolt Gate Latches. A Heavy Duty Spring Loaded Gate Wheel that more than meets its specification - it really is Spring Loaded, Heavy Duty and supports a 200lb Gate. Farm Gate Hangers - Click on the Pin or Hanger you're interested in. Double Strap Hinges - Click on the Hinge you're interested in. 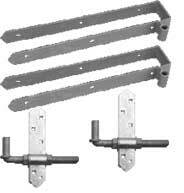 Central Eye 5", 12", 18", 24"
Rear Eye 5", 12", 18", 24"
Farm Gate Latches - Click on the Latch you're interested in. A Heavy Duty Spring Loaded Gate Wheel that more than meets its specification - it really is Spring Loaded, Heavy Duty and supports a 250lb Gate. Carriage Bolts are not included with Single Strap hinges and Hangers (where required), all other hardware comes with the required fasteners.